Finally, I’m back! I’m back after the month-end trip to several locations in the country. That was actually a 3-day trip, just having time to relax after doing all of these blogging stuffs and of course to fully unleash the pressure stuck both from my full time job and this blogging endeavor. It may sound strange, but I’m certain that was the best thing I have to do. And now, I’m all set. I’m all set again to bring you the latest tech news– ranging from gadgets, computers, the internet, and social media. But before I publish the first article for this month, allow me to thank all of you a million times. Why? Simply because, CebuTechBlogger.com already hit the 1-million page views milestone, according to Blogger.com stats. Back in July, Blogger launched a new feature called Blogger Stats. It’s basically similar to Google Analytics which tracks site web traffic. 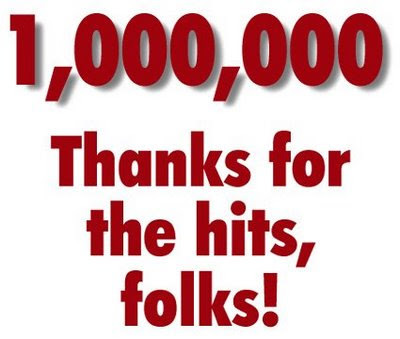 On November 30th, this blog received the 1-millionth page view. And because of that, I would like to extend my sincerest thanks for your continuous support on this blog. It’s always a pleasure that you regularly read my posts and join my community. That’s pretty inspiring! Next PostCebu Tech Blogger Wishes You a Merry Christmas! Greenpois0n Untethered Jailbreak for iOS 4.2.1 (Mac Version) is out!